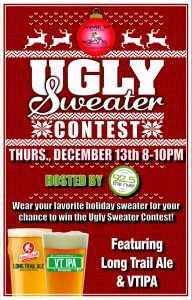 Home » Events » Ugly Sweater Party At The Peddlers Daughter In Nashua, NH! Ugly Sweater Party At The Peddlers Daughter In Nashua, NH! Join the River and Long Trail Brewing Thursday, December 13th from 8-10PM at The Peddlers Daughter in Nashua to celebrate the season! Enjoy a frosty cold Long Trail Ale, plus take part in the ugly sweater competition! Since 1989, Long Trail has been a leader in the craft brewing industry. Join the fun and some holiday cheer while showcasing your finest holiday sweater. After all, Christmas comes but once a year, and when else are you going to wear one? Besides, the lucky winner of the contest will win a prize courtesy of Long Trail! The River will be there so stop by and take a spin on the prize wheel. Join the River Roadies for some Holiday Fun at the Peddlers Daughter where there’s always a great selection of food and craft-brewed beers! For hours, directions, and more details visit https://www.facebook.com/PeddlersNashua/ or http://www.thepeddlersdaughter.com/.